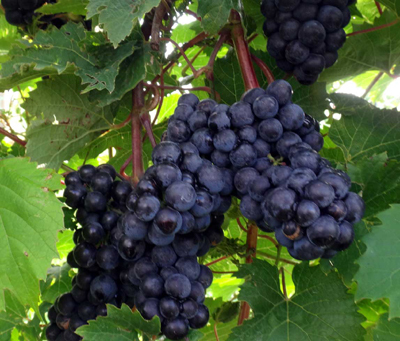 The Petite Pearl wine grape is the newest cold climate red wine grape. It is considered fully hardy, producing a full crop after -32◦ F. Vigor is moderate and bud break is mid-season. Petite Pearl wine has Syrah (primary grape variety used to make the famous red Rhône wines of Côte Rotie) – like qualities. It also has good tannins and structure. Petite Pearl is deep ruby-red and should age well. Early wines have been very complex with lots of spice and jammy fruit qualities. It may be an excellent blending component to add complexity and softness to most northern red wines. Petite pearl can also stand on its own. Without a doubt this new variety is going to be a game changer for cold hardy hybrid winemaker’s who wish to produce an age worthy, dry red.